A very common North Indian Dessert made especially on and for the very colorful Holi Festival Celebration. This one is my personal favorite too. 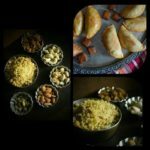 Earlier we used to always have the market bought Gujiyas every holi.The little Dumplings drenched in sugar syrup otherwise one would not have, but on Holi, amidst the Rangoli colors all wet and soaked in water, you just crave for these fried and sweet dumplings filled with coconut and dry fruits. I have tried making these in two different ways. One is a dry Gujiyas and the other is with a glaze. You may also dip the Gujiyas post frying in sugar syrup. I made a Jaggery glaze and just dipped the Gujiyas on one side into the glaze and served.This way it gets a tinge of sugary flavor but the syrup doesn’t get all soaked inside out. Also, since am always adding a bit of twist to all my recipes, this too is no exception. Add a few dry apricots to your filling and just enjoy the health in your dessert. Also you may alter the quantity of sugar as per your taste. You may also use sugar free for this recipe for a Diabetic recipe.The preperation time is 15 mins for getting the ingredients ready and 30 mins for resting the Dough. A very common North Indian Dessert made especially on and for the very colorful Holi Festival Celebration. This one is my personal favorite too. 2 tbsp Butter Ghee Clarified /Desi : . 3 tbsp Sugar : . Water to knead a soft dough. 1/4 cup Sugar / Sugar free Natura :th +3 tbsp. 2 tbsp Raisins : . 2 tbsp Pista / Pistachio chio : . 1 tbsp Cashew : . : xbd Strands Saffron tsp. 2 tbsp Almonds : . 2 tbsp Ghee Mawa to roast the : . For the Dough: In a food processor / a bowl take the flour ,salt, sugar and ghee and mix well till it gets a crumbly texture and the ghee is mixed in the flour well. Now add little water at once and knead a soft dough. Keep this dough in the refrigerator for about 30 minutes. After 30 min knead the dough again lightly with your hands before use. Soak the saffron strands in 2 tbsp. Milk. We will need this when we roast the Mawa/Khoya. For the Filling: In a pan dry roast the almonds and cashews. Roast on simmer and roast till they get a golden color. Keep aside to cool. Now, in the pan add 2 tbsp. ghee and roast the Mawa. Roast on simmer .Once the mawa gets a light golden color add the grated / desiccated coconut. Roast for another 5 minutes and add the saffron Milk. Mix and let the milk be soaked and the mixture look a bit together .This may take just a few minutes. Put it off heat and transfer this mix to another dish to cool. 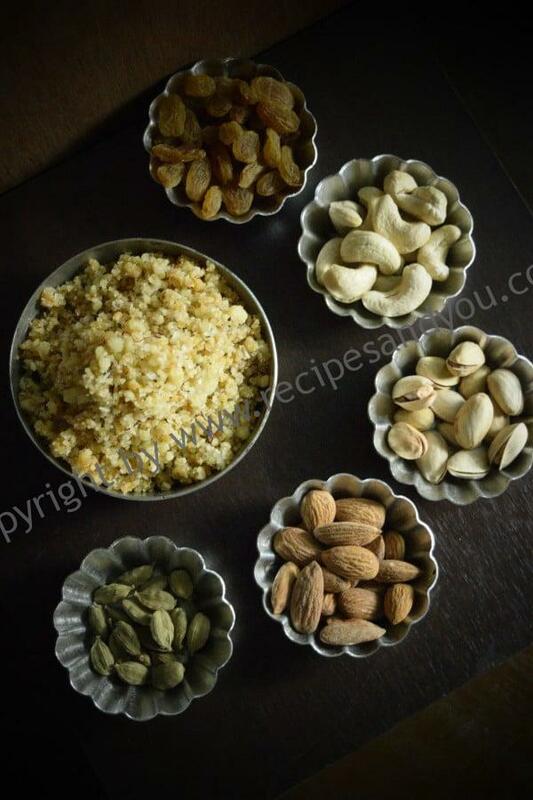 In a mixer, add almonds, cashew, green cardamom, raisins, apricots, pistachio and grind on pulse .Donu2019t make it too fine. Add this mix to the Mawa and coconut Mixture and mix well. We are ready to make Gujiyas now. Roll the Gujiya dough and make 6 equal small balles.Roll one ball at once into a circle, insert into the Gujiyas mould. 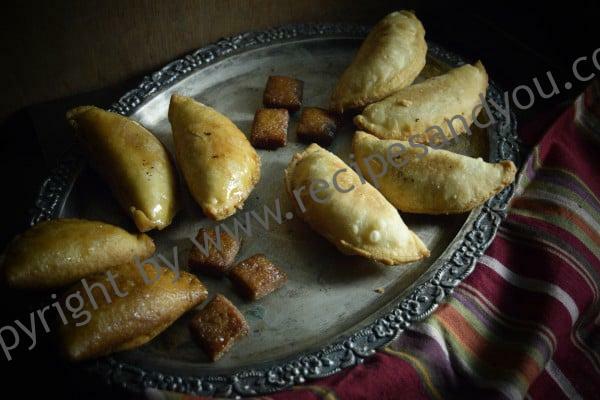 Add 1tbsp of filling, seal the Gujiyas with Maida water paste and close the mould to fix. Make all Gujiyas and keep covered. Heat oil in kadai, once the oil is little warm reduce the flame and start frying Gujiyas. Remember the oil should not be very hot, otherwise the cover will remain a bit undercooked and the shell will not come out very crisp. 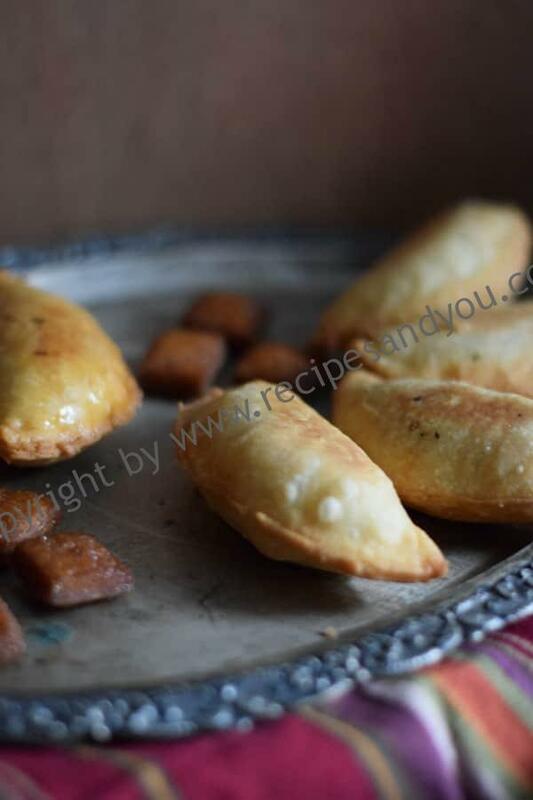 Enjoy your Holi with these scrumptious Gujiyas!